Normally I post a lot more on Wednesdays....but this week I was busy. I was able to go see my Tampa Bay Rays! 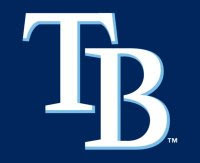 By the way the Tampa Bay Rays are not in Tampa. They are in St. Petersburg (where I live). There have been threats to move them recently, and I hope that it doesn't happen. It is amazing being able to walk to and from the baseball games. Anyways, in case you haven't heard...Rays are #1. They have been pretty much all season. Not only have they kept a lead over the Yankees, Red Socks and other teams in their divison, but they have kept a lead over everyone else as well. We were the first team to hit 30 wins (and it took awhile for another team to get there....the Cincinnati Reds which are my 2nd favorite team since I grew up there) and if we win tomorrow we will be at 40! Okay...enough bragging...sort of. Tonight's game was honestly the best game I have ever been to. I have been to dozens and dozens of games in my 26 (geez...almost 27) years, but I have never seen any really GREAT games live. Tonight we beat the Toronto Blue Jays 10-1. It would have been 10 to zip if not for some pitching issues. We also had 3 Home runs tonight! The one that really made my night was from Carlos Pena. He has been my favorite player since he has been with the Rays. This year his contract is up and his bat has been hit or miss (he has been either getting a homer or striking out). So, I have been really worried about whether they will keep him. Last night he had a solo home run and a Grand Slam...talk about amazing. Tonight was the first time I have been there for one of his Home runs! He is now leading our team in Homers..12 for this season. Go Carlos! Sorry to ramble. If you would like to see my Man Carlos Pena's home run you can watch it here. I know that Krystal is going to be the only one to probably appreciate this post, but that is okay. I love you all for humoring me. Go Rays! Ohh...to throw in a Thrifty thought. My tickets cost me $8 a piece (it was a bronze game & we sat in the top section) = $16 for a date night. We were bad and ate hot dogs and purchased a refillable drink = $20. Total for an unforgetable night of baseball= $36 (if we had been good it could have been about $21). Not too shabby.